In higher education, student success is commonly defined as persistence in a bachelor’s degree program, leading to a timely completion of that program. For first-time freshmen, timely graduation would be in four to six years after admission to the university. The equivalent for new transfer students would be two to four years. Defined this way, Cal Poly students are among the most successful in the California State University (CSU), yet all groups of students do not graduate at the same rate. There are achievement gaps between under-represented minority (URM) and non-URM students, as well as between students receiving and not receiving Pell Grants. The CSU Graduation Initiative has set ambitious goals for all 23 campuses to achieve by the year 2025. These goals address the achievement gaps as well as the four- and six-year graduation rates; Cal Poly’s goals are indicated below. Freshman First Year Retention Rate. of first-time freshmen entering in Fall of 2015 were still enrolled in Fall 2016. 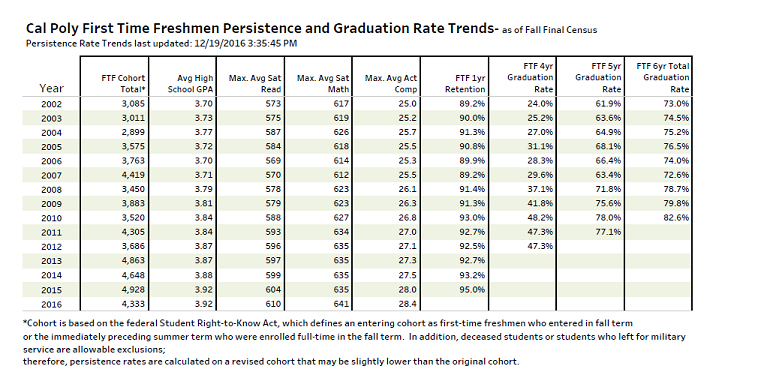 See First Time Freshmen Persistence and Graduation Rate Trends for more information. Freshman Four Year Graduation Rate. of first-time freshmen entering in Fall 2012 graduated in four years. 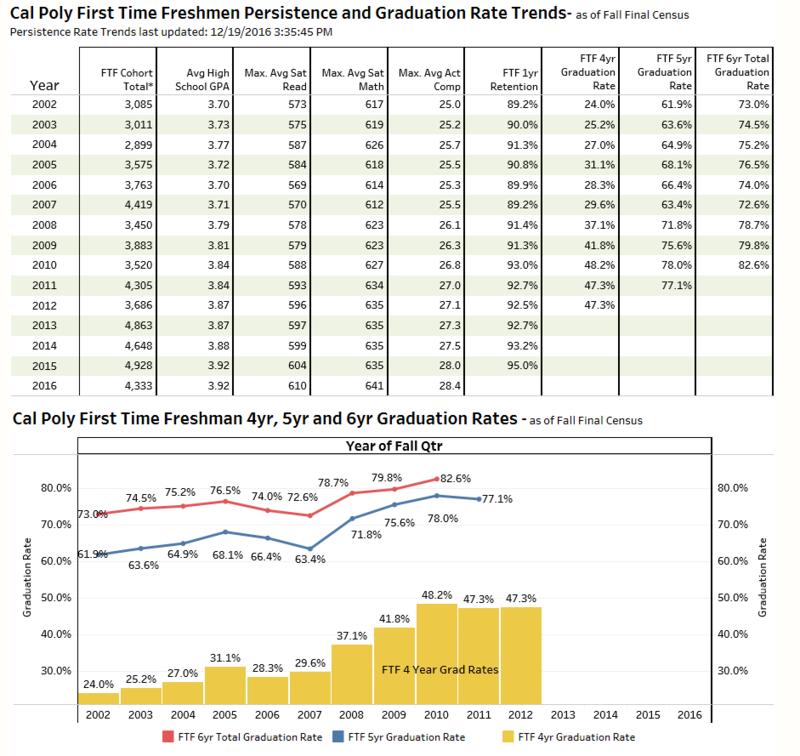 For the CSU Graduation Initiative, Cal Poly's 2025 goal is a 71% four-year graduation rate for first-time freshmen. Freshman Six Year Graduation Rate. of first-time freshmen entering in Fall 2010 graduated in six years. For the CSU Graduation Initiative, Cal Poly's 2025 goal is a 92% six-year graduation rate for first-time freshmen. of new transfer students entering in Fall 2014 graduated in two years. For the CSU Graduation Initiative, Cal Poly's 2025 goal is a 45% two-year and 93% four-ear graduation rate for new transfer students. 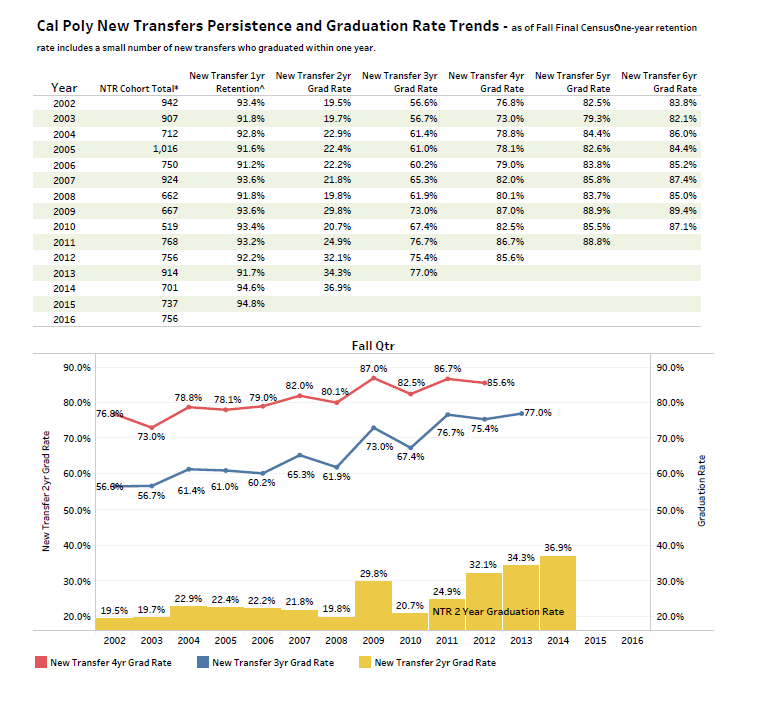 See New Transfers Persistence and Graduation Rate Trends for more information. 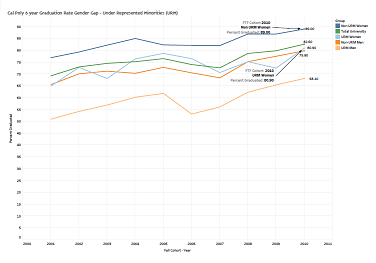 Achievement Gaps: Under Represented Minorities. was the gap between the six-year graduation rates of under-represented minority (URM) and non-URM students in the Fall 2010 cohort. This is down from a high of 13.4% for the Fall 2009 cohort. For the CSU Graduation Initiative, Cal Poly’s 2025 goal is to completely close the six-year-graduation gap between URM and non-URM status. 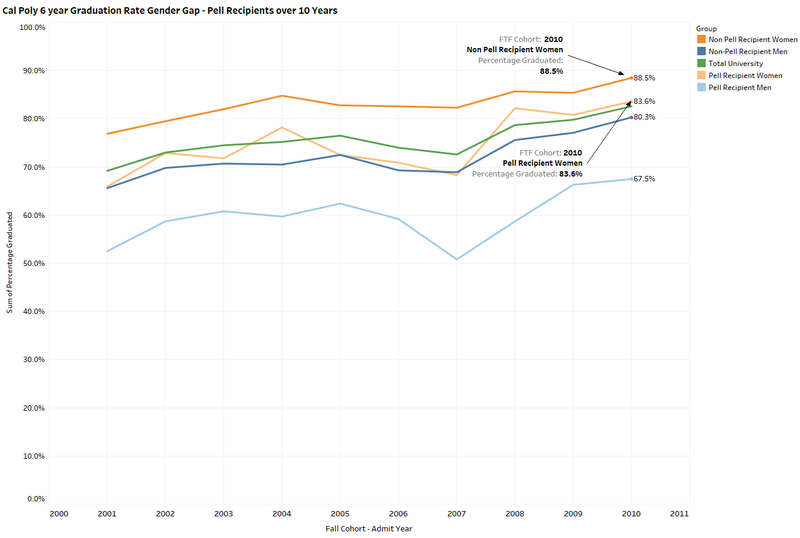 was the gap between the six-year graduation rates of students receiving and students not receiving Pell Grants in the Fall 2010 cohort. This is up from a low of 8.1 for the Fall 2009 cohort but down from a high of 16.6 for the Fall 2007 cohort. For the CSU Graduation Initiative, Cal Poly’s 2025 goal is to completely close the six-year-graduation gap students receiving and students not receiving Pell Grants.